The 4th annual “Heart of a Child” benefit concert will be held Saturday, April 25, 2015 at 7 pm. This concert will once again showcase some of the very best young musicians in San Diego County featuring a diverse array of talented vocalists and instrumentalists. This year, for the first time, the concert will be held at the prestigious Irwin M Jacobs Qualcomm Hall in Sorrento Valley. 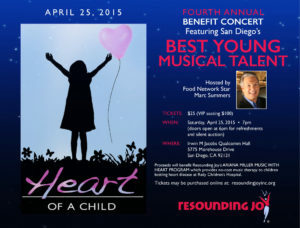 All proceeds will benefit Resounding Joy’s Ariana Miller Music with Heart Program which provides no-cost music therapy to children battling heart disease at Rady Children’s Hospital. San Diego Imaging’s Dr. Jeffrey Miller and his wife helped create this program in memory of their daughter Ariana.